This page summarizes the changes made in INVEST Version 1.1 to create Version 1.2. You spoke and FHWA listened! 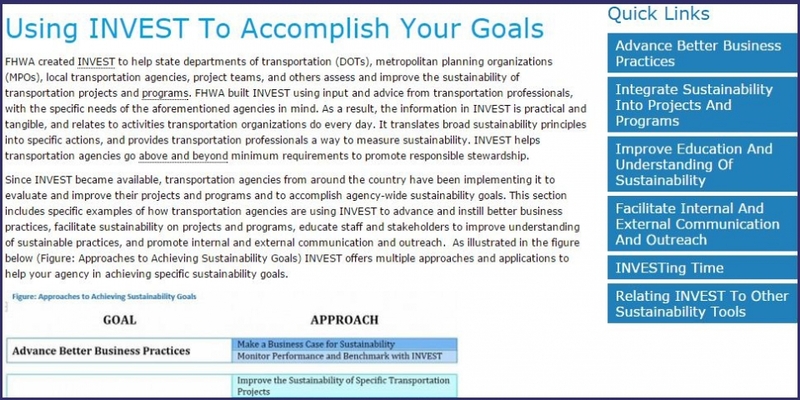 After launching INVEST Version 1.0, FHWA underwent a process of soliciting feedback from users from States, MPOs, Local Agencies, Federal Lands, and more. Each of the comments received was thoroughly reviewed and modifications to the INVEST framework, criteria, and online tool were made in response. The release of Version 1.1 in January 2015 introduced minor edits, formatting changes, and tool enhancements that did not affect scoring. With the release of Version 1.2, FHWA completes the responses to comments that required more substantial changes. 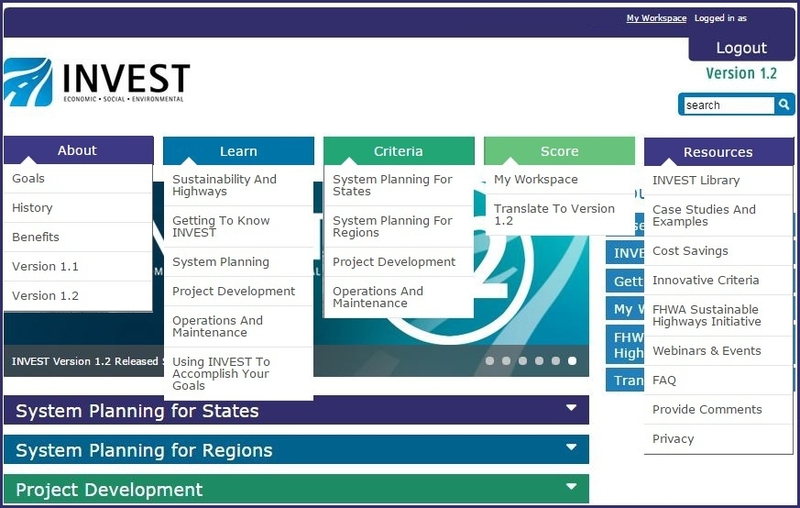 Version 1.2 includes significant changes to criteria, scorecards, modules, and scoring in INVEST (Click here to view a Matrix of INVEST Version 1.2 Criteria Changes). This first expanding group of questions below describe the major changes that were made and the last few expanding questions describe the transition to Version 1.2, and what that means for project and program evaluations already underway. System Planning has been replaced by "System Planning for States" and "System Planning for Regions". The System Planning (SP) module has been replaced by System Planning for States (SPS) and System Planning for Regions (SPR), which are focused more specifically on the types of users and the activities specific to them. The SPS module is for states or agencies owning infrastructure and the SPR module is for regional agencies like MPOs. The criteria topics remain the same between the two modules; that is each has the same SP-01 through SP-17 titles. However, the scoring requirements for each are better aligned to nuances in the activities that the respective type of agency performs. A bonus Innovative Criterion has been added. Up to three Innovative Criteria, IN-01 through IN-03, have been added per scorecard for each of the four modules (SPR, SPS, PD and OM). The Innovative Criteria allow users to define sustainable innovations and emerging technologies that they have addressed that are not included in INVEST in order to earn credit for these innovations. The credits earned for using Innovative Criterion are bonus points earned because no points are included in the total number of points achievable for this criterion. Organizations desiring to use the Innovative Criteria will fill out a form and a template for a new criterion on their topic. The form requests basic information, confirms the topic is not already included in INVEST, and confirms that it goes above and beyond regulations and the standard practice of care. This is submitted to FHWA for a quick review, and will be added to the project or program scorecard if and when concurrence by FHWA is obtained. The examples submitted will also be available to share under the new RESOURCES tab on the website. Five new criteria have been added to the PD module and one criterion has been removed. Five new criteria have been added to the PD module and one criterion has been removed, as shown below. Existing criteria have been modified. Existing criteria have been modified to clarify scoring, add new methods of achieving credit, and add opportunities to earn partial credit. In addition, pertinent information which is not referenced but may be useful is also included in the Resources section for many criteria. A Matrix of INVEST Version 1.2 Criteria Changes is available here. A Resources Section has been added to the Criteria Write-ups. A new section, called Resources, has been added to each of the criteria write-ups. References in the document are now numbered with superscripts and the reference information is consolidated under the Resources section. In addition, references which are not referenced but may be useful are also included in Resources for many criteria. Links to Case Studies and Criterion Examples have been added to the Online Criteria Write-ups. Links to relevant Case Studies and Criterion Examples have been added to the criteria write-ups where their content will help demonstrate achievement of the criterion. This is dynamically updated as case studies are added and is only active for the online criteria write-ups (not the printable versions). For an example, see PD-03: Context Sensitive Project Development. A new guide, called Using INVEST to Accomplish your Goals, has been added. Relating INVEST to Other Sustainability Tools. The website has been reorganized and tabs have been renamed to aid in navigation. The INVEST website has been reorganized under 5 new tabs: ABOUT, LEARN, CRITERIA, SCORE, and RESOURCES. Information that was included in Version 1.0 has been reorganized under these tabs and a lot of new information has been added. The figure below shows the main tabs with the dropdown topics. A Recreational and Scenic scorecard has been added. Tool Enhancements have been launched. New Sustainable Downloads Manager Reduces Printed Materials. A new downloads manager has been developed that includes information from the ABOUT and LEARN tabs as well as the compendium of criteria. The manager will allow users to self-select which parts of each are downloaded, making electronic documentation customizable (for example, choosing System Planning for Regions instead of System Planning for States) and minimizing printing by users. A search feature has been added to the Case Studies page (as shown below) that allows users to sort for specific case study information that may be of most use to them. The Website Transitioned to Version 1.2 on September 14th, 2015. INVEST Version 1.2 is launched and available for new evaluations. For existing evaluations, you may opt to upgrade to the latest version, v1.2, and any responses that match will be automatically brought over. All project information and collaborators will be saved. Please take time to review INVEST 1.2 before making the permanent transtion. The translation function will become available during the week of September 14th, 2015. All New Project and Program Evaluations will be in Version 1.2 of INVEST. When Version 1.2 was launched on September 14th, 2015 all new project and program evaluations will be started in Version 1.2 and it will no longer be possible to start a new project or program evaluation using Version 1.1 of INVEST. Translation of Existing Evaluations to Version 1.2 is optional. All evaluations previous to September 14, 2015, are in Version 1.1 and will remain so until the user makes the decision to translate them to Version 1.2, which can be done by selecting a button on the scorecard and confirming their intent. Any responses that match INVEST Versions 1.1 and 1.2 will be automatically brought over. All project information and collaborators will be saved. This function is permanent and not reversable (however a project can be duplicated prior to making the translation). Please explore INVEST Version 1.2 before making the translation of existing projects. Users choosing to leave their existing scorecards in Version 1.1 will be able to continue scoring and will have access to the Version 1.1 scoring tool by selecting to continue scoring the existing project or program. It is anticipated that this access will be available for several years. When choosing to translate a project or program to Version 1.2, all relevant scores will be maintained (that is, response to questions that have not changed will remain unchanged). In addition, all notes, collaborators and uploads will remain. The user will need to rescore items in many of the existing criteria to reflect changes included in Version 1.2 and will need to score new criteria; a table is available here to describe the changes to each of the criteria and necessary scoring updates to assist in this rescoring.